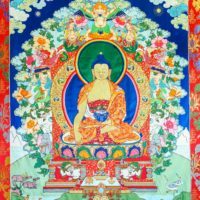 Chenrezig (known as Avalokiteshvara in Sanskrit) represents the full awakening of the compassionate heart — our own and that of all the buddhas’. Incarnated as the Dalai Lama, he is also the patron deity of Tibet. This quilted thangka is a blend of traditional and contemporary stitchery. Leslie Rinchen-Wongmo stitched the figure of Chenrezig by hand, using traditional Tibetan appliqué methods, silk satin and brocade. She then set the figure in a machine-quilted cotton ground of blues, greens, and violets. The soft, rollable artwork has a fabric tunnel at the back for hanging on a rod. Size: 43″ x 31″ (109 x 79 cm).